So I haven’t been on here as much lately…. Mostly because I’ve been kind of boring of late… And well, I feel like I’d bore you with recounts of my days of lazing about on the computer and crocheting while watching Dr who re-runs online. I did finally got my etsy.com store up and running! It is called InspirationVaries. (click on it to go there!) .. not much of my work on there just yet, but I do have the Beer Muffs available now, I encourage custom color requests (gives me direction)! I’ll be making some fancy ones in the next few days as well… found some pretty cool yarns for a really good price! I will be updating the site soon with jewelery I’ve made and some of my hand painted silks… and eventually some note cards with my photography (I’d really like to do these on hand made paper… but that fancy might have to wait til spring when I’ll be in one place long enough for paper pulp to dry. So far, I’ve sold about a dozen beer muffs! (thanks to some wonderful friends!) none through etsy yet, but i have paypal working now so that just makes it easier since it’s connected. But the venue through which i sell them doesn’t so much matter, what matters is it adds to my small stack of gas money for the upcoming road trip! I am confident that I can get to everywhere I want to go… but it would be awfully nice to have a little extra for adding to the adventures… I am pretty good at living on the cheap… and living well at that… but somethings you just have to shell out a little chunk for. “What happens in Vegas stays in Vegas” not this time… I plan to blog about it. Oh, and the camera is very durable…and waterproof. 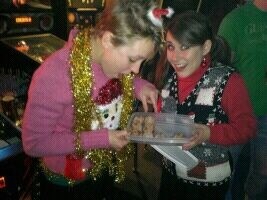 I know, not a frontal photo of the sweater… but I’m busy sampling Amber’s schweddy holiday balls . Well tomorrow is a day of finishing up my Christmas present project and hopefully not nursing sickness. My poor roomie has been sick for the past week, she’s finally feeling better now. I’ve had a aireborne every now and again and I thought that I had made it through scott free…. But I’ve got the beginnings of an ominous sinus headache. I’ve pounded another airborne, taken some zicam now I’m off to bed at a semi-reasonable hour for the first time in a while. Hurray for sales. I had started an etsy account back in the day to sell my fused glass pendants. Never made any through there either but I think you’re right. It doesn’t really matter where you sell them as long as they get sold. Have fun in Vegas. I saw Cirque in Orlando. If I hadn’t gotten a discount through a friend of a friend who worked there I probably couldn’t have afforded it either.